← FlapJacks Canadian- Northern Alberta Style. 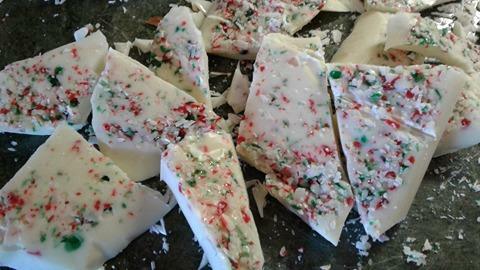 White chocolate melting chips were gotten with crushed peppermint canes were gotten at Christmas time but with everything going on and me struggling with illness. nothing got done with is.. Simple and easy to make but a great showy little piece at the same time to serve on a tray or break up and put in a pretty Valentine’s gift bag for after dinner party favours. 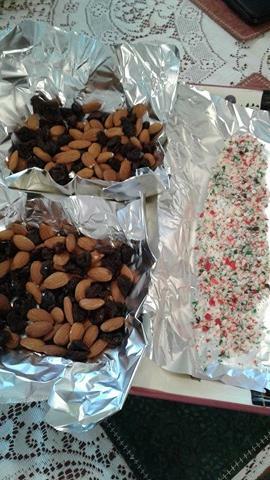 I used a serving tray with different sizes, I made the candy cane one long and thin bark and I made the other two loaded with dried cherries and almonds and made it twice as thick. Pick your tray be it a loaf pan, a pie pan or if push come shove, just make a mold out of your tin foil as long as it’s on a pick up board, plate. The joy of making your own bark is you pick the kind of chocolate, you pick the filling, and you pick the thickness of the end product.. it’s all about what you like.. Melt your chocolate in a pot, bowl over top a pot of water or if you microwave, slow short bursts of heat and then stir till it’s all melted.. 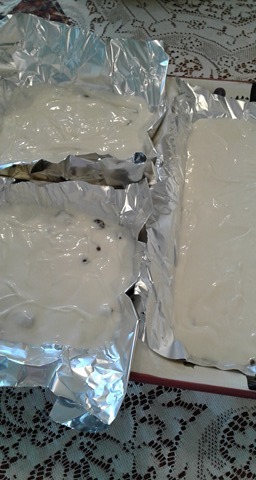 Please remember to get melting chocolate for this type of project, it just makes your life so much easier. Pour over top.. shake your tin to settle the chocolate and then put in the freezer or fridge, in my case I put it out into a snow bank on one of my lawn chairs to freeze up.. Once its cooled and hardened back up, it will peel off the edges and be ready to just turn over.. Then you can cut it.. I like to cut it in half or thirds and then into triangles, it will break off uneven but give your nice looking pieces. 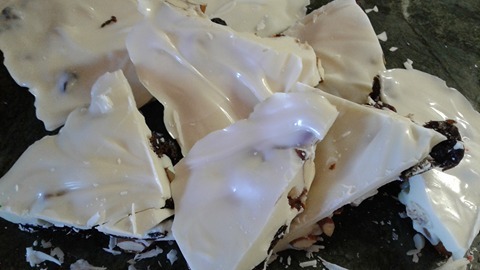 This entry was posted in Carfts an Hobbies and tagged Cherry and Almond White Chocolate Bark, Homemade Chocolate Bark, Make Chocolate Bark for Valentines. Bookmark the permalink.